Here is our availability for May. I may have a few updates as the month goes on. Stay tuned! And do not forget to come to the Columbus Area Fish Enthusiasts Spring Auction May 4th! Go to columbusfishclub.org for all the details. Aphyosemion bitaeniatum “Mbanga” Two Stripe Killifish 1″-1 1/4″ $15/pr. Aphyosemion exigoideum “BWW 00/2” False Jewel Killifish 1″-1 1/4″ $20/pr. 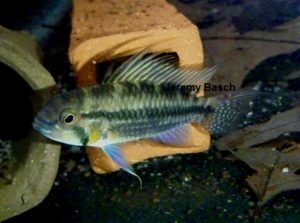 Apistogramma cacatuoides “Peru” F-1 Cockatoo Dwarf Cichlid 3/4″-1″ $5 ea. Hypancistrus zebra F-2 Zebra Pleco 1 1/4″+ $125 ea. Fundulopanchax garderni “Jos Plateau” Steel Blue Killifish 3/4″-1″ $8/pr. Fundulopanchax sjoestedi “Dwarf Red Gularis” Dwarf Red Gularis 3″+ $25/pr. Aphyosemion amoenum “Sakabayeme” Beautiful Killifish 1 1/4″ $30/pr. Aphyosemion elberti “Diang Yellow” Elbert’s Killifish 1″ $15/pr. Aphyosemion exigoideum “BWW 00/2” False Jewel Killifish 1″ $20/pr. Aphyosemion primigenium “GBN 88/10” Primitive Killifish 1″ $12/pr. Aphyosemion striatum “Lambarene” F-2 Red Striped Killifish 1 1/4″ $10/pr. We often get asked what we are currently keeping and breeding. Below is a current list of the fish that are in our fishroom.